Stila has some really great products, so I'm always on the lookout for a Stila bargain that I can score. I was out shopping this morning and came across the Stila Smudge Sticks at Mecca Cosmetica. I'd heard all about these smudge sticks, people have been raving about them since they came out. After ogling countless pictures of their Smudge Stick in Koi, I finally got a chance to see it in person. I didn't layer on the sticks so you're more able to see how pigmented each stick is. In my opinion, Koi (the golden colour), Silver Dollar (a very highly pigmented, true silver), and Moray (a deep olive shimmer) are the creamiest and most beautiful colours. The other colours glide on just as smoothly, but you'll need to build up a couple of extra layers before they are at their most vibrant. 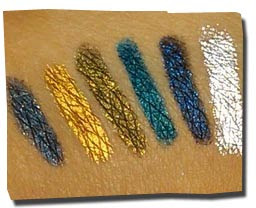 These are swatches of the liners that were layered on thickly. I had these on the entire day, with plenty of smudge worthy moments and hand washes (the swatches were, after all on my hands), and these liners have held up pretty well. The most vibrant and long-lasting by far was Silver Dollar, followed by Koi, and then Moray. Purple Tang held up pretty well also. The rest weren't as good, but still long-lasting compared to other liners.